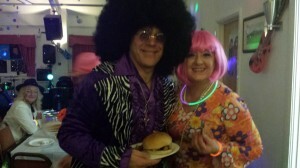 A 1970’s Themed Party With Hog Roast, Whitefield. What better way to celebrate your 50th birthday than by having a 1970s themed party and a hog roast to delight your guests? We felt like we were watching Saturday Night Fever in action when we arrived to serve a hog roast at Urmston Cricket Club, near Whitefield, to be greeted by 100 party goers with big hair, flares, platforms and medallions. We had a groovy time preparing our feast as we watched guests boogieing on down and working up an appetite dancing to the hits of the seventies. A hog roast Whitefield sandwich, with apple sauce and hot stuffing, is hearty and filling and it never disappoints. And we were delighted when one of the guests said our specialty crackling was the best she’d ever tasted (and she said she’s tried loads). There was plenty of hog roast in Whitefield left over so we left some for the last night snackers. As we cleared up the guests were back on the dance floor as we boogied back to our base in Astley.